16 x 16 x 2 Inch - SHIPS FREE! 16 x 16 x 3 Inch - SHIPS FREE! 18 x 16 x 2 Inch - SHIPS FREE! 18 x 16 x 3 Inch - SHIPS FREE! 18 x 18 x 3 Inch - SHIPS FREE! 20 x 16 x 2 Inch - SHIPS FREE! 20 x 16 x 3 Inch - SHIPS FREE! 20 x 18 x 2 Inch - SHIPS FREE! 20 x 18 x 3 Inch - SHIPS FREE! 22 x 18 x 2 Inch - SHIPS FREE! 22 x 18 x 3 Inch - SHIPS FREE! 24 x 18 x 2 Inch - SHIPS FREE! 24 x 18 x 3 Inch - SHIPS FREE! NYOrtho Gel-Foam Cushion 9595 series combines high density foam with an inner dual chambered gel insert to support and relieve pressure for those patients at risk of pressure injuries. This combination effectively prevents pressure ulcers common for those who sit in one position for too long which reduces blood circulation. 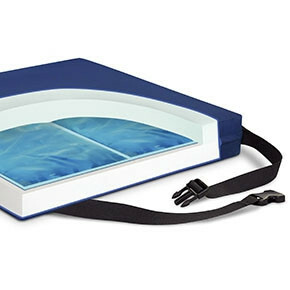 This seating and positioning wheelchair cushion relieves pressure but also supports the frame while promoting proper positioning. 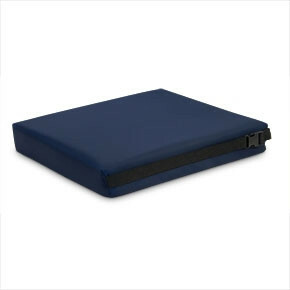 NYOrtho Gel-Foam Wheelchair Cushions come with a fluid-resistant cover that has built-in antimicrobial properties. The fabric is low-sheer to be gentle to the skin. It's made with quick-release straps so it can be secured to the wheelchair and a skid-proof bottom to keep cushion in place for added safety. Choose from two cushion heights that's available in 16, 18, 20, 22 and 24-inch widths in order to provide the best fit for you. 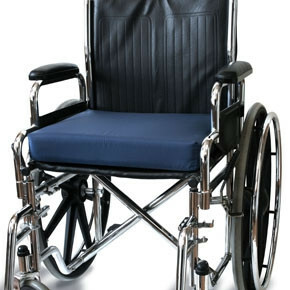 You may also be interested in other NYOrtho products like the Convoluted Gel Foam Wheelchair Cushion for improved air circulation and patient comfort.